Uses live bait, dry flies or wet flies? Bo, they keep their back legs on the shore line, and use the front six to monitor their "web"...which is the water surface, it self. 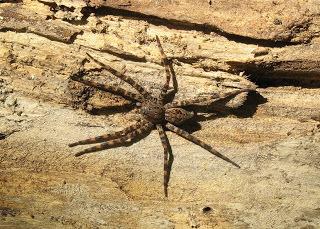 The species Dolomedes tenebrosus is more frequently associated with wooded areas (it would be more accurately classified as a tree-dwelling spider) and is a common household invader in these locations. It occurs from New England and Can ada south to Florida and Texas.